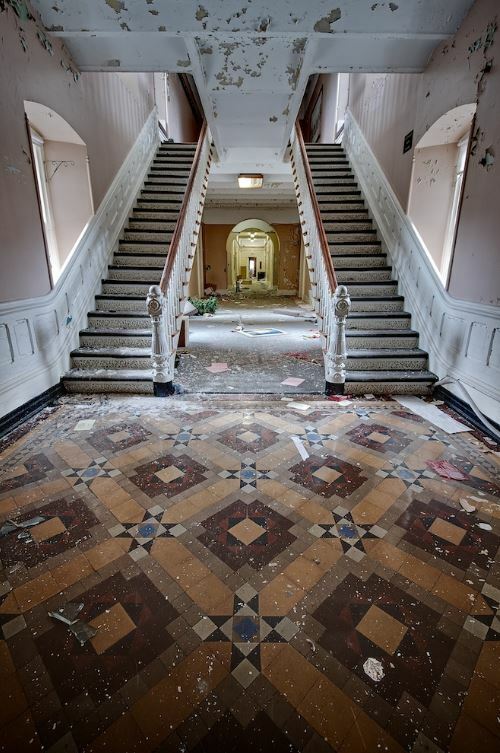 Final demolition of the Greystone Park State Hospital in Morristown, New Jersey, was unfortunate for the preservationists who fought to keep the structure alive. 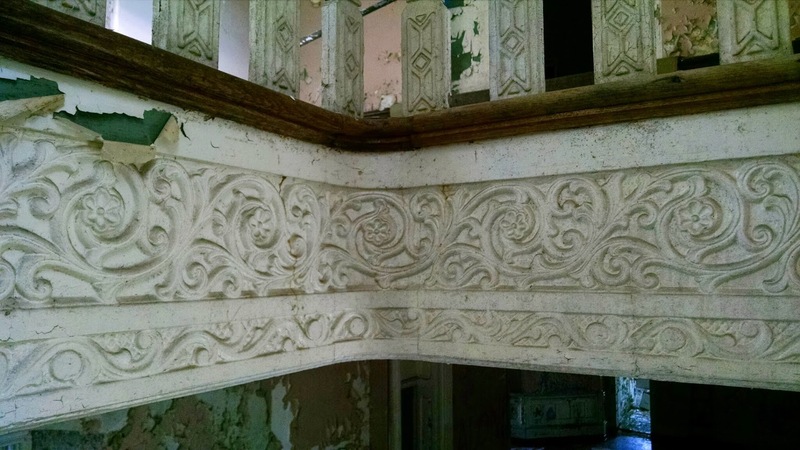 But for those who were able to salvage a piece of the former asylum’s history, the hospital’s demise threw open a treasure chest of amazing artifacts. Photo by Ed Roppo. Greystone Park was featured in the 90s film Marvin’s Room with Leonardo DiCaprio and Meryl Streep. It also appeared in the television series House, M.D. The massive Second Empire Victorian hospital opened in 1876 under the name of the New Jersey State Lunatic Asylum. It was designed according to the principles of Thomas Story Kirkbride, who initiated a contagious series of similar institutions during this period. 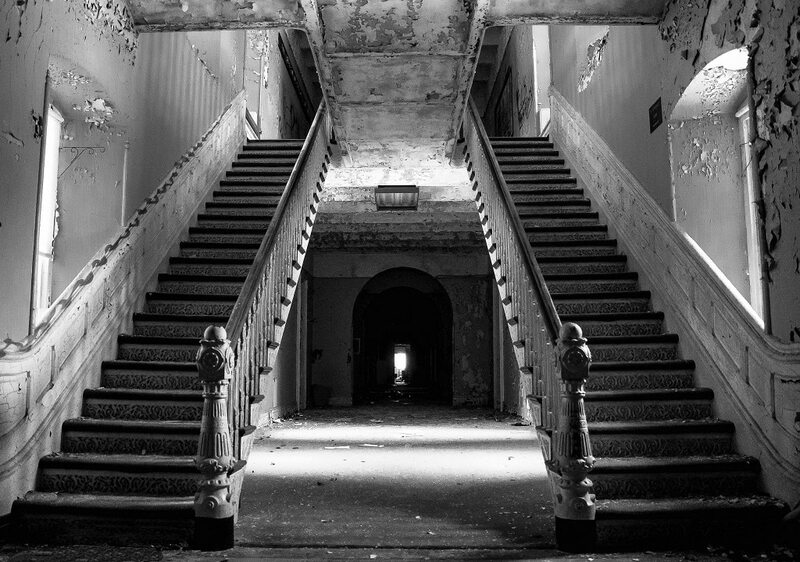 Kirkbride structures were meant to be curative to the mentally ill — boasting large, airy spaces with plenty of natural light, a central building, and symmetrical wings set back from the core. Kirkbride, who was working as a psychiatrist before there was such a thing, believed that mentally ill patients could be cured in months with the right care. He envisioned bright spaces filled with dancing and games and orderly wings that organized patients according to their disorders. Before the rise of these institutions, those suffering from mental illness were lodged in jails, houses for the destitute, or the family cellar. Kirkbride’s innovative theories were evident in the construction of the 673,706 square foot hospital. Large communal parlors, connected wards, and each tier’s access to private outdoor space are just a few examples of the Kirkbride Plan. Stunning architectural details in the final estate included a veritable fortress of gneiss stone walls and sandstone and wood modillion cornices. Decorative tile floors, wood pocket doors, window seats, and vaulted ceilings, along with custom wood sculptures and stained glass windows in the chapel, added to the aura of grandeur and the ambiance of healing. 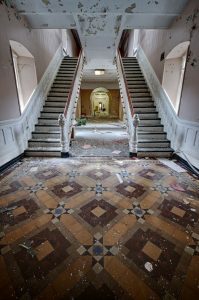 Greystone Park was emptied of its last patients in 2008. The estate was turned over to the State of New Jersey, which held historic tours and events on the premises, bringing in around 60,000 visitors annually. 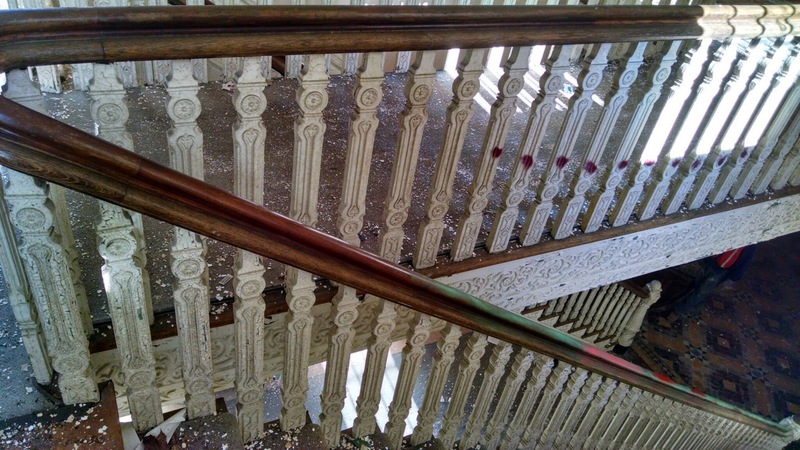 All proposals to renovate the disintegrating buildings were eventually rejected and, after numerous protests and a long battle between historic preservationists and the state, the final phase of demolition was completed in Fall 2015. Some columns and other architectural elements were preserved on site, with the vast 190 acres set aside for recreational use. The long-debated destruction of the historic building is significant in that it fueled a whole new preservation movement to save the nation’s historic psychiatric hospitals, including the founding of PreservationWorks, an asylum advocacy group. 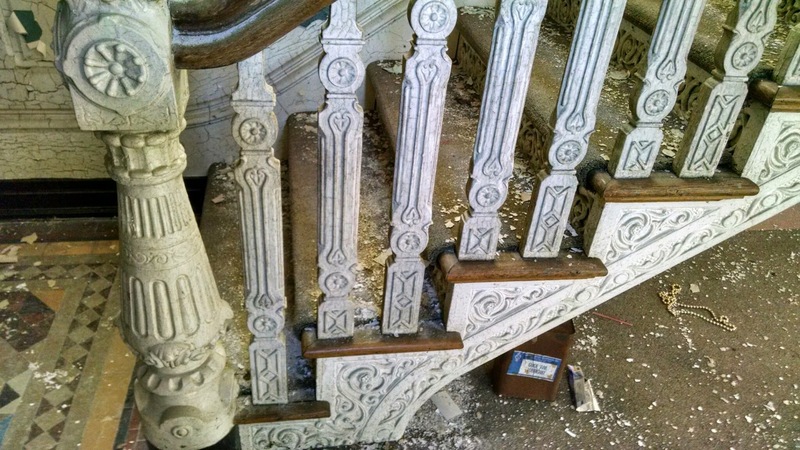 A set of formidable cast iron staircases was rescued from the main building before Greystone Park fell. Like their lost brothers and sisters, these staircases feature detailed balustrades, skirting, and risers distinguished by unique Victorian motifs. The staircases are a magnificent tribute to Kinkade’s compassionate vision and a fascinating aspect of history. The architecturologists of Olde Good Things have carefully removed and catalogued each piece so they can be re-installed into a new building project. Whoever acquires either one or both of these staircases will have countless great conversations about this timeless centerpiece. To find out about other items acquired from this project, inquire by email or call Olde Good Things at 888-233-9678. 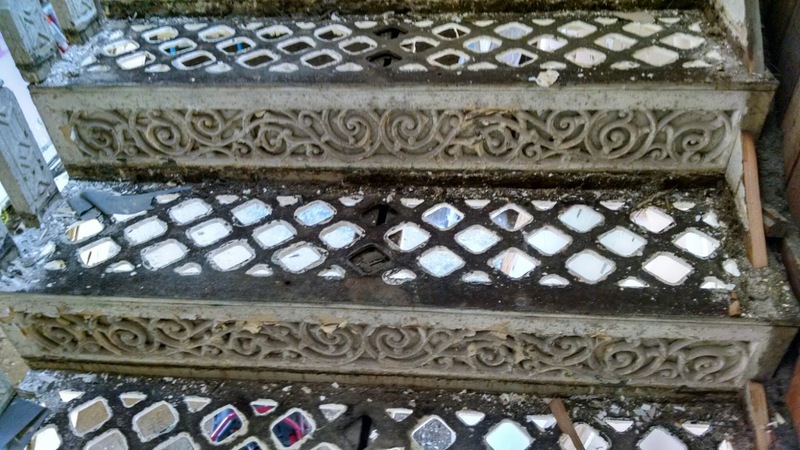 Thanks for sharing this wonderful story about the history of these staircases. Wish I could have seen the hospital before it was torn down..!